Fans of berserkers will need to include those mod in their load order. Yeah, I also like Estherians. I hope berserker fans will like it. I hope you can include all hairstyles in the Estherians (for female long hair). I think it's a shame if the Estherians Female Long Hair is only for NPCs. I wonder, Is it possible you also add skins that are used on BIA & BIA-W? I like skin Face/Head & Hair on Musha, Brute Geezer, Part-Time Vendors and so on. @Sch123 what's your idea again for the toggle skill? This is my idea about toggle skills for Embermage. Tier III Bonus: +%Chance to Summoning a Small Fire Guardian that will explode on it's target . For Tier III "% Chance to Summoning a Small Elemental Guardian effect that will explode on it's target", you may be able to use active skills in Summoning Ritual Mod "Ordeal of Sacrifice". Even though there are only elemental fire summon, but I think it is adjusted to the element we choose. So when we choose Blessing from ice guardian we will summoning small ice guardian. @Sch123 No, I don't think it is that simple. The male head has a different circumference than the female, so I don't think it will work by just transferring the code of female hairstyles into male's. We will need someone who is proficient in 3D application for this. Can you try some, I wonder what happens if it's done. I thought, if a large head size is a problem (Berserker & Engineer) maybe you can use the Embermage & Outlander head to be paired with a female hairstyle, because the size is not much different from the female head size. Effect increases by 1 as we add points, on Max you will get 15. "-15 to Weapon equipment requirements"
"-15 to Armor equipment requirements"
I'll try if I can implement this. By the way, How about adding skills to the Embermage class? especially Summoning skills for the Guardian Element. Yes, thank you. I'll add these summoning skills. Done. I also added scroll learning efficiency into Focus Mastery. There are still skills that don't work. The Guardian of Fire skill only appears in the Outlander Share skill, while in Embermage does not. Animated particles from Storm Vortex are still problematic. - Can you add a bleed effect to the General Passive "Minion Mastery" so he has the opportunity to give bleed status when attacking an opponent? - I think there is still one long Female Estherians hair that hasn't been added. - And also I found there are several skins that are the same as each other. I suspect it was because, on some skins that were added using the same face / head but did not change the color of the skin or did not change his face. For example the Naked Cyborg skin that uses the same facial skin as the original skin. Because we use the Alternative outfit, the Naked skin Cyborg is covered with outfit so it looks the same as vanilla skin. That's the cause of a double skin. Can the skin that has no face change, don't be included to the expansion skill, to reduce the double skin. For example on Male Embermage Hair Style no. 1,2,9,14,24,45. It also occurs in other classes and female classes. - There are also hair colors that also change the color of Ear & Horn animal. For example on Male Embermage Hair Color no. 48,49,50,51. It also occurs in other classes and female classes. - I also found the number of hair colors is different, Male (51) and Female (52) hair colors. - I see a repetition of hair color, is it really made like that? can it be that there is no repetition of hair color. About the recurring skins, can you provide me their numbers?...maybe the order in-game is based on the order where I put them in the code. So that I can pin-point which ones to remove. The female estherian long hair you referring to is not in the mod files. I cannot make it up so, that's why it is not included. Fixed Ember Mage's Fire Guardian, thanks. I found the missing file of Storm Vortex. I found the missing file of Poison Tornado. Blood Lust, Spirit of Death, Root of Life, Root of Death, and Pool of Death must be missing Stat data issue, all are found and included. Thunder Strike weapon req has been removed. - Guardian of Darkness = You can only get a maximum of 6 Werewolf, and each of your summon you will call 2 werewolves. But at the first call I got 3 werewolves that were supposed to be 2 werewolves. There are also some skills that have no effects / affixes on information skills. I'm tracing the skin that's problematic, it takes a little time. It's finished with the Male section in the Female section. Because we use several skins from several mods, maybe I can pin point the hair color of each Mod, so there are no recurring colors. For example: For Female hair, the color of hair from Female Outlander on Edrobot's Exotic Skins No 25-32.
so only that color is added from the many hair colors in Edrobot's Exotic Skins. Is this method good enough to reduce recurring colors? I have also seen .DDS files for hair color, but I find it hard to determine which colors are suitable for adding. I think, if you use the hair coloring method from the Alternate Outfits, the hair color won't repeat. The idea is to only use hair color files from Alternate Outfits and some hair color files for Female from Edrobot's Exotic Mod. 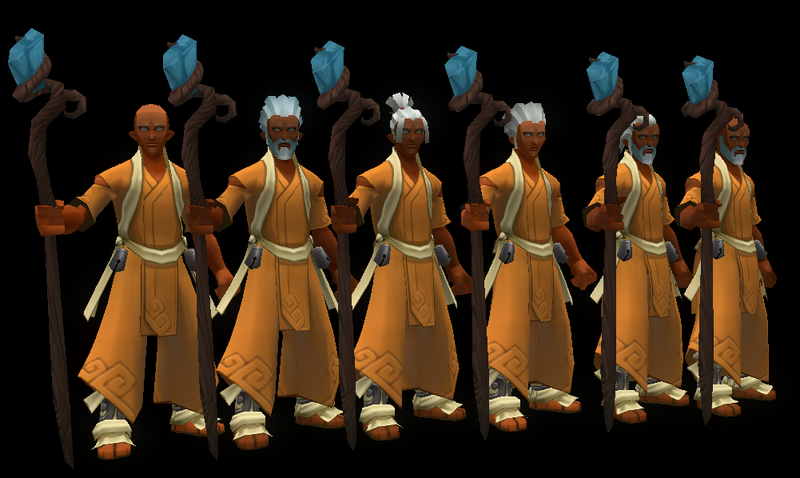 And later Male will have 24 hair colors while Female will have 32 hair colors. Also don't use the hair color from the vanilla file either, because there will definitely be a recurring hair color due to the hairstyle owned by Outlander (Bandana, Headband, Hair Tie). It seems like the Alternate Outfits also doesn't use the vanilla hair color file, more precisely he discards the duplicate hair color. I have finished checking the skin of Male & Female. For Female I need further checking, but Female seems don't have a lot of problems like Male. You are accurate on the Skin/Face and the hairstyles. The haircolors on the other hand, 16-29 are from Edrobot's Exotic Skins mod. Also you lack 1 feature/count, total of female haircolors should be 52 (based on the code). As you can see in the code, no values are the same. All were meticulously applied, the problem I'm facing is not code-wise but actual appearance in-game. Now, that you have the grasp on what the visual look and code view. I think you can point out which features (count) should we leave behind or which to be removed. *Male and Female do not share same codes but I think we can make them have equal counts, please provide me also for the Males, on which should remain in the mod. **Haircolors for Male and Female have different coding values but they both use the same file (PNG / DDS). Also, I think the estherian hair colors are essential for the estherian hairstyles to be colored properly, using other haircolors made them look like black hair with colored highlights (Which is cool too). The one you linked, the original thread for Estherian Classes, is just the same with the one I used. Both do not contain the long-haired female estherian. He said on the thread that he will leave out that hairtype and make it into an NPC. Although I'm not sure where we can obtain it. 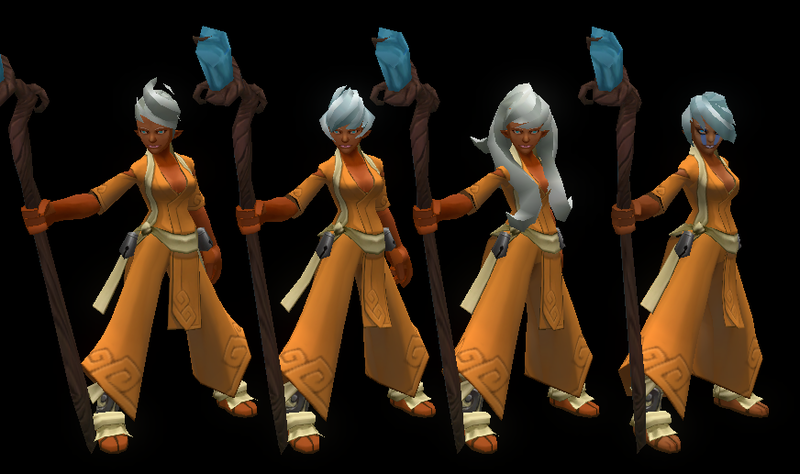 Syl the Sage Skin's hair and face are also good. Are you interested in adding this too? I want to ask about Hair Color for Vanilla. Does the color for vanilla only have 15, as far as I know there are 18. Sorry if I'm wrong. 6 colors x 3 accessories. Color: Brown, Black, Blond, Red, Gray, White. And for Esterian Hair Color It Looks good on Esterian's (Bread, Mustache) face & hair, but not for face & hair that uses Google, Eye Patch, Horn. The color also changes all of it into one color with hair color. And also make Bandana, Headband, Hair Tie to be brown. Is there a solution to fix this? I'm not sure if Hair color No. 48 is included in Unleash the Rainbow / Alternate, I'm more sure if he belongs to Esterians. Because only esterian hair color changes the color of hair accessories to brown & also affect horn color. For Exotic Hair Color there is a slight difference between Male and Female. In Female there is a unique hair color while in Male there is no. I am still doubtful about add Esterian Hair Color, because this color does not work well on face hair other than esterian & this also affects other head / face accessories. But on the other hand it looks good on Esterians. General Passive >> "Minion Mastery"
- Add a chance for to do bleed effect to the General Passive "Minion Mastery" so he has the opportunity to give bleed status when attacking an opponent. "convey 2% physical damage (base on Pet max damage) over 5 seconds" >> on Max rank "convey 30% (base on Pet max damage) physical damage over 5 seconds"
- Add a decreased Pet's travel time to the town. "10% decreased pet town travel time" >> on Max rank "80% decreased pet town travel time"
General Passive >> "Vitality Mastery"
- Add Potion of effectiveness. So any Potion effects and duration will get stronger and a little longer. "+2% Potion of effectiveness" >> on Max rank "+30% Potion of effectiveness"
After trying to play using the Berserker class, I had the idea to change some skills to make it more suitable & more unique. And I also have the idea of Toggle Skill so it can save a little time. Can you change the name "Blood Lust" to "Bloodlust". @doudley Can you see files in this Happy's DeathKnight mod, because there are new skins there. If there are new skins as they are said, I think that skin can replace porcelain skin. I like those new changes for general passives and thank you for the number of haircolors. Will I use, the toggle skills of blade dancer into ember mage proposed toggle skills? I don't think elemental mastery should be focused on berserkers. I think berserkers should remain shadowy, cold, and brutal. Have you tried my BiA mod? There you can use korg and skaar, they have the special skill to charm enemies...you can witness its power and it is definitely too much, possibly the reason why the devs removed that effect in the actual game. I'm not against it entirely but I merely request to decrease its chance to work and please provide duration. 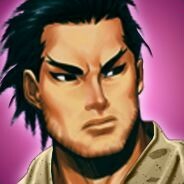 And yeah, feel free to post your desired new skill icon look. I can compile and convert them myself. If Syl the Sage skin mod can be scrapped, then we will include it in our mod. About the vanilla hair colors, this time, I will add them from the original data and not from other mods so that we can avoid discrepancies. Estherian hair color, maybe I can tweak it to include coloring of facial hair. We'll see. #48 hair color, you saw the values, its 201196. Estherian uses 9 digit values "519201000". But maybe, the #48 in-game is #49 in the code, that's why you see it for sure that it is not from estherian. Btw, are you sure if I follow your number of hair colors, there would be no more duplicate or similarly similar color hue? OK, I'll do that and good job finding this mod. I'm glad if you like it & You are welcome. Will I use, the toggle skills of blade dancer into ember mage proposed toggle skills? You don't have to use that, I suggested that so we don't need to make it from scratch, indeed there is still a need to add it here and there. But if you are more comfortable to make toggle skills from scratch I don't mind. I don't think elemental mastery should be focused on berserkers. I think berserkers should remain shadowy, cold, and brutal. - The Phantom Slash skill turned out to be quite similar to Ravage's skill so I asked to be replaced with a no less ferocious skill, the Cruelty skill from Blade Dancer. If you have tried it, this skill is very suitable for a brutal Berserker. Very suitable for 1vs 1 with strong opponents, for example, against Champion & Boss. - As for the Storm Vortex skill I asked to be replaced with the Tempest skill (Thunder Storm from Blade Dancer) because I felt the Berserker class was still lacking in skill for area control. Where if we face a lot of opponents this skill becomes the right solution. And this skill matches the Berserker "Tundra" Skill Tab in which there are elemental Ice & Lightning skills. And when it comes to brutality, cold & shadow, I guarantee that the Tempest skill (Thunder Storm from Blade Dancer) can be categorized into that. In addition, when we use these skills will change the atmosphere to be very cloudy, and Lightning struck from the sky attacking the enemy. For charm Tier bonus II Spirit of Death I got the idea from a Ninja class Charm skill. if the damage is too high for you, you can lower it so it's not too high. Awesome, I will look for an icon skill if it matches the theme and skill effect. I just feel less comfortable if there is the same skill icon, at least there is no same skill icon in one class. Thank you, hope it can be scrapped. No 48-52, It Looks good on Esterian's (Bread, Mustache) face & hair, but not for face & hair that uses Google, Eye Patch, Horn. The color also changes all of it into one color with hair color. And also make Bandana, Headband, Hair Tie to be brown. At least there will be a repetition of hair color when using Hair Style with accessories. Because that is what is in vanilla, while for other additional colors there seems to be no repetition. I think we can also use some icon skills from this mod. Thank you for justifying your choice. I'm convinced to replace Phantom Slash with Cruelty from Blade Dancer class and replace Storm Vortex with Thunder Storm from Blade Dancer then change its name into "Tempest" (I like this new name too). About estherian hair colors that doesn't exclude the goggles, horns, etc...I'm not sure if I can fix that kind of problem but I'll try to fix it if it is possible without going into meshes. About recycling skill icons from deathknight mod, just point me what icon to use and where to use it our mod. Hopefully tomorrow, I can get back into coding. So far, my week has been busy. If not tomorrow, I still have this Saturday. I plan to send you a new test build this coming weekend so that we can move the progress faster. I think we also should slightly change the skill description, to make the skill slightly different from the original skill. What do you think? For example: like the "shunpo" skill from ninja, which uses the skill name in the description so it doesn't match with the new skill name. Can you tweak the Tempest skill when we cast the skill then a trumpet also will be heard. You can use the sound of the trumpet in the Mongol Archer skill "Ranger Squad". I imagined, it like a warning before the storm came. There are some icons that are not suitable but I want to know your opinion whether this is good or not to change that icon. > Honestly, I prefer your own researched icons. And yeah, if there are needed change in the skill descriptions, feel free to provide. Its an easy enough task to change those anyway. P.S. Darn it!...I forgot to back up the mod files, I'm already on may way back to my home. This means, I won't be able to build a test mod this weekend. Sorry.